The construction boom in Pyongyang, along with other indicators of improved economic performance such as food production and foreign trade, provide further evidence of the ineffectiveness of current economic sanctions. The North Korean economy appears to be beating sanctions thanks to Chinese aid and trade, as well as the reallocation of conventional defense spending to the civilian economy. The 105-story shell of the Ryugyong Hotel has loomed for decades in the middle of Pyongyang as a reminder of North Korea’s post-Soviet economic woes. Today this narrative of destitution seems belied by the breakneck speed of architectural developments in the rest of the city, such as the prestigious Ryomyong Street. There are so many glistening new buildings in Pyongyang that the city is unrecognizable from what it was ten years ago. This construction boom seems to contradict the assumption that sanctions against North Korea would weaken its economy to the breaking point of denuclearization. 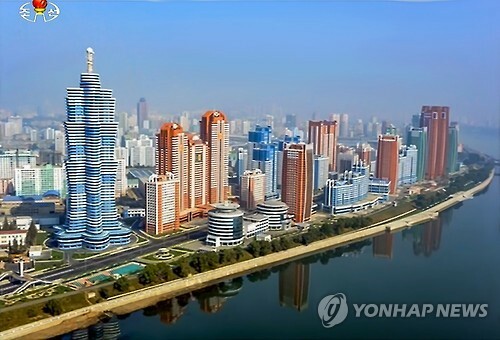 But are Pyongyang’s new high-rise buildings mere facades hiding the last spasms of a dying republic, as critics claim? Or are they the symbols of a new “dawn” and of triumph over economic siege, as the government contends? Has Kim Jong Un’s byungjin policy of simultaneous nuclear and economic development succeeded in its aim to free up conventional defense funds for reallocation to people’s livelihoods? Or is this all just elaborate propaganda? When 18 towers standing up to 48 stories tall appeared in the heart of the city in 2012, foreign diplomats gave it the nickname “Pyonghattan” but generally assumed it would be a one-off publicity stunt. As it turns out, Kim Jong Un has inaugurated a grand, new apartment complex nearly every year since he assumed power. In 2013 and 2014, he saw the completion of housing projects dedicated to the developers of the Unha space launch vehicles (Unha Scientists Street) and the Kwangmyongsong satellites (Wisong Scientists Street). In 2015, he honored the “scientists of the future” with 2,500 new apartments on Mirae Scientists Street, on the occasion of the 65th anniversary of the Workers’ Party of Korea (WPK). 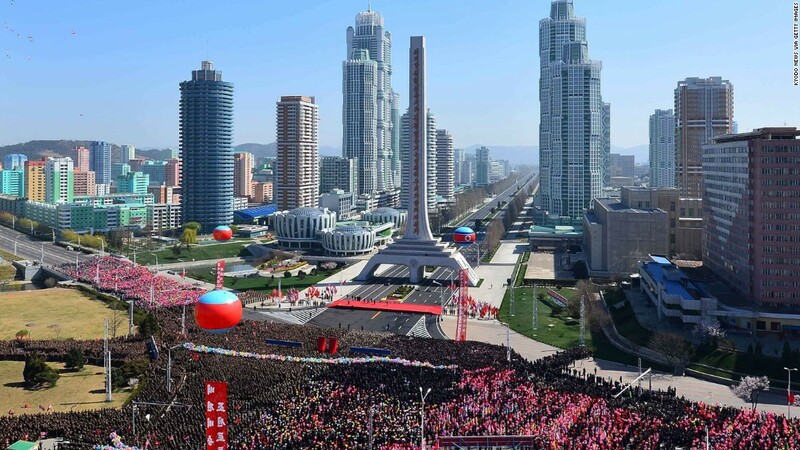 Finally, in 2017, he celebrated the 105th birthday of national founder Kim Il Sung with more than 3,000 units in the new Ryomyong Street complex. Functional buildings have been springing up as well, such as the Mansudae People’s Theater (2012), Munsu Water Park (2013), Sunan Airport (2015) and the Science and Technology Center (2015), to name a few. Even the big residential projects are purportedly finished in less than a year, and propaganda slogans boast of “Mallima speed” (10,000-mile horse speed), harking back to the “Chollima” (1,000-mile horse) campaigns that spurred Pyongyang’s reconstruction after the Korean War. North Korea observers have been perplexed by how the state can bear such construction costs given the breadth of economic sanctions imposed against the state. Of course, the notion of cost in the country’s planned economy differs considerably from that in market economies. What real labor costs are there if most of the work is done by the Korean People’s Army? And what real material costs are there if the building materials are mostly supplied by state-owned companies? For instance, North Korea appears to be essentially self-sufficient in cement thanks to abundant limestone reserves and state factories such as the Sunchon Cement Complex, which reportedly produces between six and seven million tons annually. Yet however much the notion of cost differs in a planned economy, the state cannot simply create something out of nothing. There must be a cost borne somewhere, beyond the opportunity cost of directing resources and manpower to the architectural rejuvenation of Pyongyang. At the very least, one must account for the wear and tear of construction equipment, for the human and mechanical energy expended and for imported building materials. Is this construction made possible by cutting corners, private capital, deficit spending or simply an improving economy? It is possible that the polished facades hide disappointing interiors. Daily NK claimed, for instance, that four-fifths of the Mirae Scientists Street apartments remained empty for at least three months after opening due to unfinished construction. More concerning, the buildings may lack structural integrity. In 2014, the country’s state-run Korean Central News Agency (KCNA) reported that a 23-story apartment building collapsed during construction due to “sloppy building” and “irresponsible supervision and control.” Unsafe methods and materials may continue to be used on other North Korean construction sites, as certain Western experts suspect. However, the central government has strong incentives to ensure that the 2014 tragedy remains an isolated incident, given the importance of Pyongyang’s architectural rejuvenation to state propaganda. This may explain why it so publicly acknowledged its responsibility in 2014, with apologies from the officials involved and hospital visits by Kim Jong Un himself. So the argument that the building spree is made affordable by cutting corners is a partial explanation at best. It is also possible that Pyongyang’s architectural rejuvenation is funded by private North Korean capital contributions. Reuters for instance reported that, “Local investors known as ‘donju,’ or ‘masters of money,’ who have earned wealth in North Korea’s growing market economy, invest jointly with the state in apartment construction.” Donjus supposedly contribute so-called loyalty donations. Depending on the donju’s relationship with the government and the legality of its business, its contributions may secure favors such as a good apartment, extended trading rights or permission to continue operating illegally. Unfortunately, there is no reliable data on the weight of donjus in the North Korean economy, and no way of evaluating their role in fueling Pyongyang’s construction boom. An objective evaluation is further complicated by the tendency of many outside reports to sensationalize the proliferation of donju as a harbinger of North Korean collapse, which risks leading to an overestimation of the weight of donjus and an underestimation of the strength of the state. This collapse narrative is often more based on the image of smuggler donjus thriving on border guard corruption at the Chinese border, than on the establishment-sanctioned donjus prospering thanks to the profits of state-owned companies in a visibly growing economy. If state-owned companies are doing well, then the state would be doing well too; thus, the spread of donju is not by itself evidence of a weak state. Ultimately, while the role of donjus certainly merits further research, the suggestion that they are the main source of construction funds remains at this point an unconfirmed hypothesis. A third way to explain North Korea’s construction frenzy is that it is overspending and exhausting its foreign reserves to import building materials. Rüdiger Frank proposed this idea in 2013, at the beginning of Kim Jong Un’s rule, drawing parallels to the unsustainable, debt-funded development he witnessed in the dying days of the East German Republic. Yet he has also noted since then that North Korean national budget reports show steadily increasing public spending on infrastructure: +4.3% for 2014, +8.7% for 2015, and +13.7% for 2016. Is North Korea more and more reckless financially, or has it found a way to overcome the foreign-reserve obstacle? Perhaps North Korea’s special trade relations with China make it less dependent on such reserves than is often assumed. China is by far North Korea’s most important trading partner and hence its most important source of and drain on foreign currency. The puzzle here is that, according to Chinese customs, Pyongyang is suffering a heavy trade deficit with Beijing (about one billion dollars in 2014), which should by itself exhaust North Korean reserves. Because the trade has not been balanced for years, some commentators believe that by accepting the situation, China is hiding a de facto subsidization of the North Korean state. Such “subsidies” could come in the form of commodities for which payment is not really expected for political reasons, or of Chinese traders accepting payment in North Korean won and reinvesting them locally, as in the renovation of the Kwangbok Area Shopping Center, co-financed by a Chinese trading company. Perhaps North Korea’s building spree has been facilitated by a reduced need for foreign reserves based on the peculiarities of its relationship to China. Finally, the country’s economy may simply not be so bad. The common prejudice that North Korea must be one of the poorest countries in the world is based on highly speculative and likely politicized GDP estimates. Comparatively speaking, our most reliable indicators are food production and trade statistics, and both indicate that North Korea is doing much better than in the 1990s, during the post-Soviet economic crisis. Data locally collected by the World Food Programme indicates that North Korea is now more or less back to the nutritional self-sufficiency of the 1980s (cereal production of about five million tons in 2012, compared to about two million in 1996) and has considerably decreased key indicators of chronic undernutrition, stunting and wasting. Figure 1. PRC-DPRK Total Bilateral Trade Volumes 1999-2016. 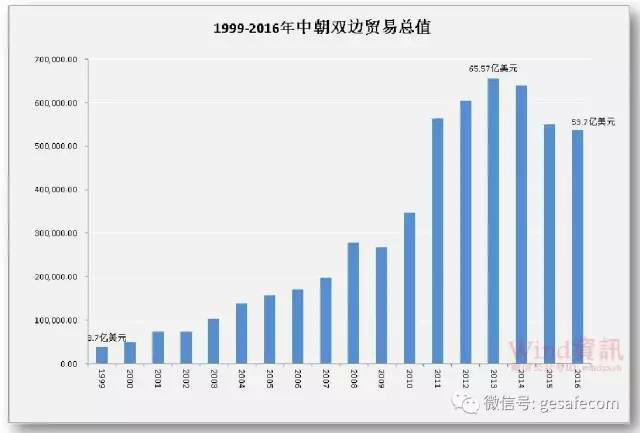 Meanwhile, trade statistics from the Chinese customs office show that PRC-DPRK trade went from 0.37 billion USD in 1999 to 5.37 billion USD in 2016 (see graph below). It then reportedly grew by nearly 40 percent in the first quarter of 2017 compared to the same period in 2016, despite the adoption of particularly harsh UN sanctions in 2016 (resolutions 2270 in March and 2321 in November). These figures are hardly reconcilable with the hypothesis of a collapsing economy, not to mention that they understate the real amount of economic activity with North Korea. The figures in general won’t show smuggling, trade in certain politically sensitive commodities, or of course Chinese “aid” and investment. Beijing has also been known to simply not release statistics certain months. After all, it has a political incentive to report trading less than it really does, to demonstrate compliance with UN sanctions. Besides trade, the North Korean nuclear program could be benefiting the economy by allowing the government to reallocate funds from conventional defense spending into development of people’s livelihoods. This seems to be the logic behind Kim Jong Un’s byungjin policy of simultaneous nuclear and economic development. North Korea’s security dilemma is that it cannot ensure national security through conventional defense spending because its military budget, said to be between $1.2 and $10 billion, is being hopelessly outspent by South Korea ($36 billion) and the United States ($606 billion). The only way to develop the economy without sacrificing security, the logic goes, is to focus on relatively cost-effective asymmetric warfare capabilities such as a nuclear deterrent. We cannot assess whether this calculus worked in practice given the unreliability of estimates for North Korea’s nuclear spending, which suggest numbers between $0.7 to $3.4 billion. That said, increased spending on people’s livelihood would help explain the ubiquity of new, domestically produced consumer goods, such as foodstuffs, cosmetics or electronics, and the drop in defector numbers by more than half since Kim Jong Un took power. For now, at least, it seems that the North Korean economy is improving, and that may be the single most important factor in Pyongyang’s ability to afford major refurbishment. The extent to which life is changing outside Pyongyang remains unclear because we have less first-hand witness accounts, but new roads are being built throughout the country and there are major urban developments in Wonsan and Rason at least. A Pyongyang full of shiny, new buildings belies the assumption that the North Korean economy is about to collapse under the weight of sanctions. While there are some valid concerns about the sturdiness of these mushrooming high-rise buildings, there are too many of them and they are too central to Kim Jong Un’s propaganda to dismiss them all as shells like the Ryugyong Hotel. Unlike his grandfather, who drew his legitimacy from military achievements, and his father, who drew it from direct connection with the national founder, Kim Jong Un depends much more on his governing performance and popular approval for legitimacy. It should be no surprise then that he focuses on highly visible signs of improving livelihoods, such as prestigious residential complexes. These developments appear to have been enabled by an improved economy, fueled in part by Chinese aid and trade, as well as the reallocation of conventional defense spending. If this interpretation of economic resurgence proves correct, then Pyongyang’s construction boom will be one more reason to doubt the effectiveness of current sanctions. Eric Talmadge, “Huge But Empty Pyramid Hotel a Sphinx-Like N. Korean Mystery,” Associated Press, December 22, 2016, http://bigstory.ap.org/article/eb5d809b58bb4a08a6142a9334bb1ec3. 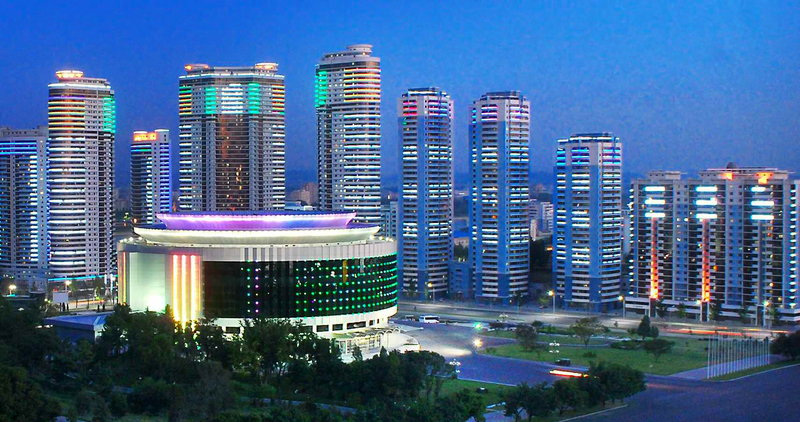 For a journalistic description of Pyongyang’s new architectural developments, see for instance: Oliver Wainwright, “The Pyonghattan Project: How North Korea’s Capital Is Transforming Into a ‘Socialist Fairyland’,” Guardian, September 11, 2015, https://www.theguardian.com/cities/2015/sep/11/pyongyang-north-korea-capital-socialist-fairyland-kim-jong-un. U.S. Geological Survey, 2013 Minerals Yearbook: Asia and the Pacific [Advance Release], 1.16, https://minerals.usgs.gov/minerals/pubs/country/2013/myb3-sum-2013-asia-pacific.pdf. Sang Yong Lee, “Apartments on Mirae Scientists’ Street ‘Frozen Solid’,” Daily NK, January 29, 2016, http://www.dailynk.com/english/read.php?num=13725&cataId=nk01500. Sang Hun Choe, “North Korea Reports ‘Serious’ Collapse at Building Project Believed to House Dozens,” New York Times, May 18, 2014, https://www.nytimes.com/2014/05/19/world/asia/north-korea-building-collapse.html?_r=0. Chad O’Caroll, “Analysis: Photos Reveal ‘Shocking’ State of North Korean Construction Industry,” NK News, May 28, 2014, http://www.telegraph.co.uk/news/worldnews/asia/northkorea/10864595/Photos-that-reveal-North-Koreas-shocking-construction-methods.html. “N. Korean Leader Visits Hospital After Deadly Apartment Collapse,” Yonhap News Agency, May 19, 2015, http://english.yonhapnews.co.kr/northkorea/2014/05/19/51/0401000000AEN20140519002700315F.html. James Pearson and Damir Sagolj, “Despite Sanctions and Isolation, Pyongyang Skyline Grows,” Reuters, May 5, 2016, http://www.reuters.com/article/us-northkorea-congress-construction-idUSKCN0XW1A0. Seol Song Ahn, “Authorities Shake Down Trading Companies for Extra Loyalty Funds,” Daily NK, http://www.dailynk.com/english/read.php?cataId=nk01500&num=13860. See below for a discussion of the state of North Korea’s economy. Sang-hun Choe, “As Economy Grows, North Korea’s Grip on Society is Tested,” New York Times, April 30, 2017, https://www.nytimes.com/2017/04/30/world/asia/north-korea-economy-marketplace.html?_r=0. Rüdiger Frank, “Exhausting Its Reserves? Sources of Finance for North Korea’s ‘Improvement of People’s Living’,” 38 North, December 12, 2013, http://38north.org/2013/12/rfrank121213/. Rüdiger Frank, “The 2016 North Korean Budget Report: 12 Observations,” 38 North, April 8, 2016, http://38north.org/2016/04/rfrank040816/. Rüdiger Frank, “North Korea’s Foreign Trade,” 38 North, October 22, 2015, http://38north.org/2015/10/rfrank102215/. See, generally, James Reilly, “The Curious Case of China’s Aid to North Korea,” Asian Survey, Vol. 54, Number 6, p. 1172. Rüdiger Frank, “Consumerism in North Korea: The Kwangbok Area Shopping Center,” 38 North, April 6, 2017, http://38north.org/2017/04/rfrank040617/. On the reasons for unreliability, see Marcus Noland, “The Black Hole of North Korea,” Foreign Policy, March 7, 2012, http://foreignpolicy.com/2012/03/07/the-black-hole-of-north-korea/. Henri Féron, “Doom and Gloom or Economic Boom? The Myth of the ‘North Korean Collapse,’” The Asia-Pacific Journal, Vol. 12, Issue 18, No. 3, May 5, 2014, http://apjjf.org/2014/12/18/Henri-Feron/4113/article.html. Food and Agricultural Organization/World Food Programme, Crop and Food Security Assessment Mission to the Democratic People’s Republic of Korea, November 28, 2013, http://documents.wfp.org/stellent/groups/public/documents/ena/wfp261353.pdf. Note that the official figures for PRC-DPRK trade reported by Chinese customs are lower than those reported by the South Korean KOTRA, because KOTRA adds an estimated value of commodities not included in the Chinese figures. Jane Perlez and Yufan Huang, “China Says Its Trade With North Korea Has Increased,” New York Times, April 13, 2017, https://www.nytimes.com/2017/04/13/world/asia/china-north-korea-trade-coal-nuclear.html. See e.g. Chris Buckley, “China hides North Korea trade in statistics,” Reuters, October 26, 2009, http://in.reuters.com/article/2009/10/26/idINIndia-43430320091026. Elizabeth Shim, “North Korea underreporting defense spending, analyst says,” UPI, March 31, 2016, http://www.upi.com/Top_News/World-News/2016/03/31/North-Korea-underreporting-defense-spending-analyst-says/2811459437466/; “N. Korean military spending nearly 30% of S. Korea’s,” Dong-a Ilbo, May 5, 2016, http://english.donga.com/Home/3/all/26/533532/1; “N. Korea spends quarter of GDP on military from 2002-2012: US data,” The Korea Times, January 4, 2016, http://www.koreatimes.co.kr/www/news/nation/2016/01/485_194556.html. Stockholm International Peace Research Institute, “SIPRI Military Expenditure Database,” https://www.sipri.org/databases/milex. James Pearson and Ju-min Park, “North Korea Overcomes Poverty, Sanctions with Cut-Price Nukes,” Reuters, January 11, 2016, http://www.reuters.com/article/us-northkorea-nuclear-money-idUSKCN0UP1G820160111. John Power, “North Korean Defectors to South Korea Hit 13-Year Low,” The Diplomat, January 15, 2016, http://thediplomat.com/2016/01/north-korean-defectors-to-south-hit-13-year-low/. Jack Kim and James Pearson, “Kim Jong Un is Leading a North Korean Construction Boom,” Reuters, November 23, 2013; Curtis Melvin, “North Korea Building New Transport Corridor and Border Crossing,” 38 North, May 4, 2015, https://www.38north.org/2015/05/cmelvin050415/. See e.g. Nicole Low, “Inside North Korea’s Newest Airport,” Daily Mail, September 28, 2015, http://www.dailymail.co.uk/news/article-3251463/First-look-North-Korea-s-200-million-Kalma-Airport-Wonsan.html. See e.g. JH Ahn, “Multiple High-Rises and Office Buildings Under Construction in Rason City,” NK News, October 19, 2016, https://www.nknews.org/pro/multiple-high-rises-and-office-buildings-under-construction-in-rason-city/; “Rason Trade Zone Bustle Exposes Limits of North Korea Sanctions,” Associated Press, September 14, 2016, http://www.asahi.com/ajw/articles/AJ201609140032.html.